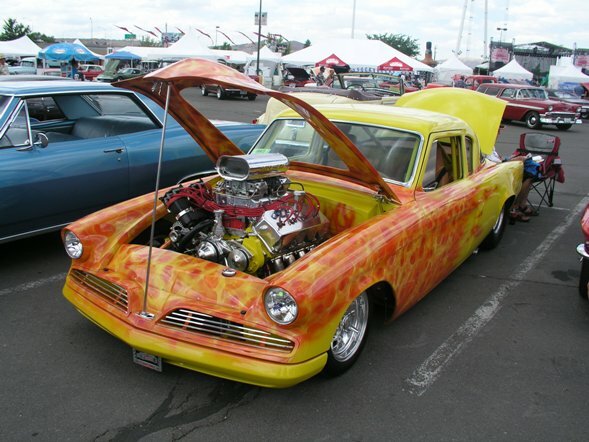 I’m not sure when I first heard of the ‘Hot August Nights’ show but I have known of it for some time. Those who had been praised it highly and said it was worth the trip. 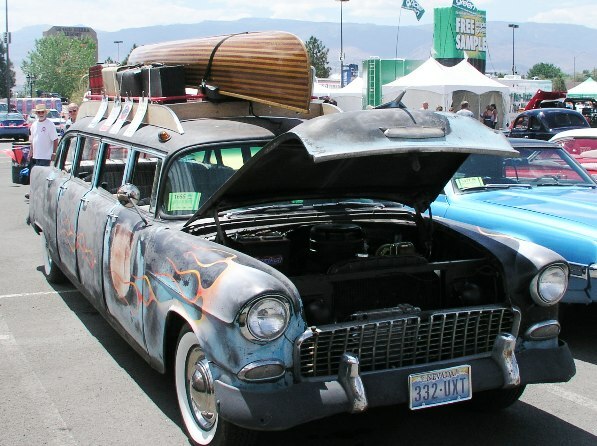 For those not familiar with ‘HAN’ as it is called, it is a week long car event held in Reno, Nevada each August and it has grown into one of the largest gathering for car enthusiasts in the country – now in it’s 22nd year of its existence. 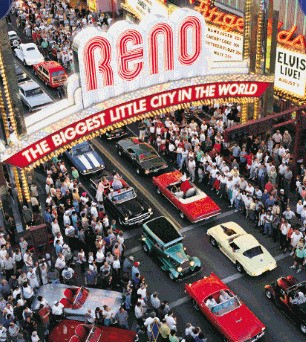 We have some friends who live in Reno, and they tell us that the show first started as a 50’s and 60’s musical event. But it gradually evolved into the car event it is today. Anyway, about two years ago I decided that I wanted to go to Reno for HAN so I went to their website and printed the form and sent it in. It turns out that they only take 5500 cars for each show! I did not know this, but soon I received a letter telling me that I was number 1803 on the waiting list. By January of 2007, I had zoomed all the way up to 1698. At this rate, I thought I might be in a nursing home by the time I make the show! January of 2008 found me at number 1328 on the list. Then in a letter dated April 30, 2008, I got the “Great News” - you have made the show! A few days later, I got a letter stating that now I was number 880 on the waiting list. Go figure! I decided to ignore that one and go with the acceptance letter. 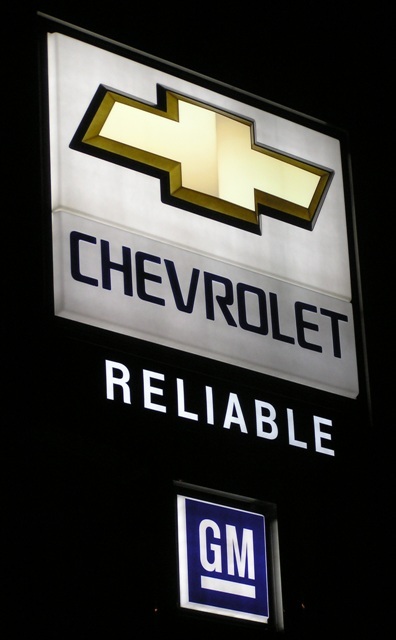 The first thing I did was to post on the Chevy Talk forum and ask some questions about the show, such as where to stay and so on. Many liked the Circus Circus hotel, as it is in the downtown area where a lot of events take place, but more importantly they dedicate one whole floor in the parking garage only for the cars in the HAN event. You even get an assigned parking space. So I called them up and got a room and I returned the form for the HAN entry. 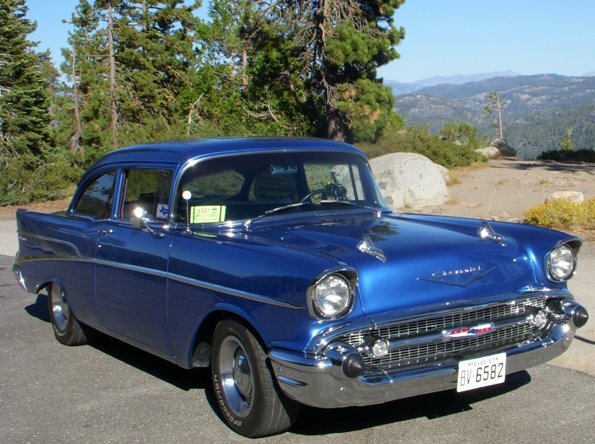 My wife Jan and I started to make our plans to drive my 1957 Chevy to Reno. I went to the Mapquest website and plugged in our address and the address of Circus Circus and found out it was 1665 miles away. We decided to take 4 days for the drive, so we could do a little sightseeing and to have some slack time in case of car trouble. As I said, HAN, runs a week, but the events such as the poker run and swap meet don’t start until mid week. So we targeted arriving on Tuesday, August 5th. I spent some time making sure the car was ready for the long trip and in doing so I discovered that the tires were wearing on the inside of the tread. To make a long story short, the lower A frame bushings were bad so I ended up replacing the A frames and got the car aligned to cure the tire wear problem. I changed the oil and filter, and collected a few spare parts and some tools for the trip. We left Dallas around 10 AM on August 2nd. 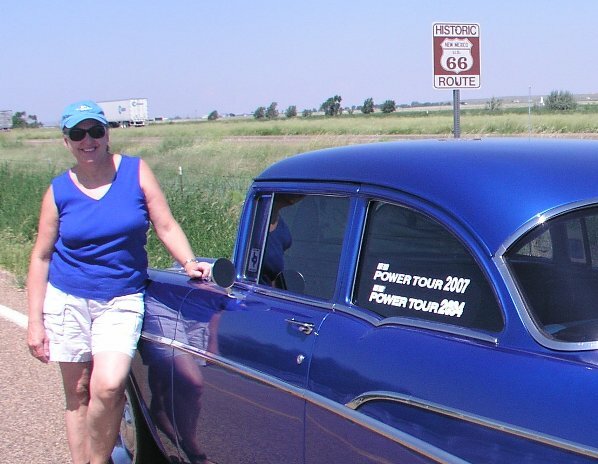 We had planned to try to make a little over 400 miles per day and wanted to drive on Route 66 as much as possible. Our trip was uneventful until mid afternoon of the first day. As we passed through Childress, Texas we checked the gas gauge and mileage, then decided we could make it to Estelline, some 10 miles down the road. I should interject here that the gas gauge in my ’57 in notoriously inaccurate. We know this and go by mileage as much as the gas gauge. But when we got to Estelline all the gas stations were closed up, boarded up in fact. At this point, it was as many miles back to Childress as it was to go on to the next town, Memphis. So we pressed on. My wife Jan was driving, and sure enough, about 2 or 3 miles out of town we ran out of gas. We sat there for a few moments and then we remembered we had a AAA Texas membership. Jan called them and they said they would bring gas to us in 30 minutes! No problem so we sat back to wait. Fortunately the weather was pretty good - not too hot with a breeze. After about 45 minutes and no gas, Jan called again. This time they said that the 30 minutes is a generic time they give out until they know what the real time will be. Then they told us it would be ay least another hour before they man would show up with the gas! Shortly after that phone call a SUV pulled up behind us. The man got out and asked us if we needed any help. He also stated he was a street rod guy and couldn’t stand to go by another car guy without stopping to offer help. Soon I was in his SUV heading for Memphis to get some gas. As we were driving we are talking cars nonstop. He has some photos of his cars and we got along famously, swapping car stories. 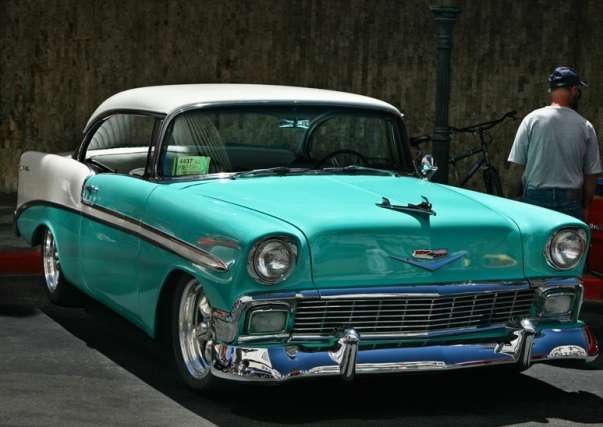 Once back to my ’57 and I put in the gas and start up the car, and then he follows us to the gas station. He refused all of my attempts to at least pay for his gas to take me back and forth to the gas station. Soon we were back on the road again and planned to stop in Amarillo for the night. The nest day dawns bright and clear and we are off and running. Soon we see a turnoff for Route 66. We take it but it doesn’t really offer much to see. However after we entered New Mexico, there were more Route 66 turnoffs with things to see such as the Mother Road Garage. This garage/junk yard has numerous old cars including many Studebakers and an old Graham. I got some photos and we were on our way again. We stopped in Gallup, New Mexico for the night. We got a little earlier start from Gallup than we had from Dallas and Amarillo, as we wanted to get to Las Vegas for the night. 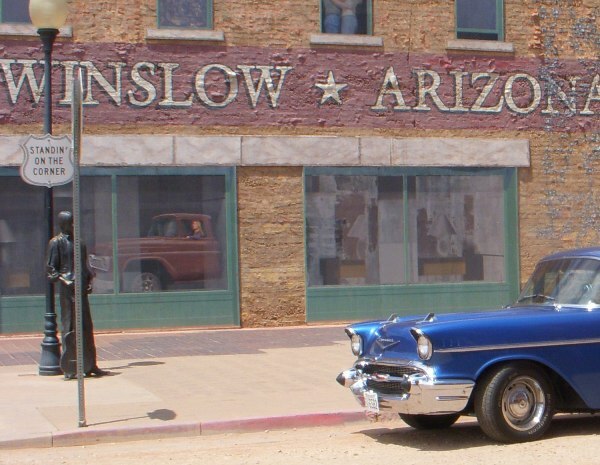 We did some more Route 66 driving including a side trip into Winslow, Arizona to see the famous “Standing on the Corner” from the Eagles hit song. I pulled up in front of the Flatbed Ford truck that sits there for a photo op. We then did a side trip into Walnut Canyon which proved to be quite interesting and beautiful. Passing through Flagstaff, Arizona we went to the old train station along Route 66 that has been turned into a museum and gift store. 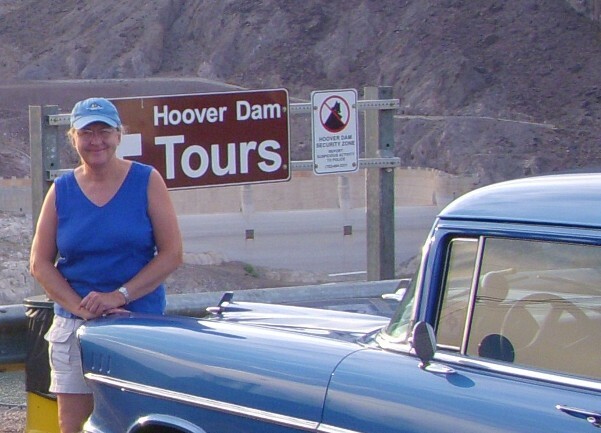 The road into Las Vegas took us by and over Hoover Dam. We stopped for a while, but it was too late for a tour. We had reserved a room at a casino called Texas Station in Vegas and just as we were making the turn into their parking lot the car quit again, having all the earmarks of being out of gas …again. We were tired and wanted to get settled in so I just grabbed the gas can and walked two blocks to the gas station and got some gas and put it in the car. I started it up and it seemed to be OK. The next day our first stop was the gas station, but it only took about 10 gallons to fill it up. This seemed strange as the tank holds 15 and I had only put in 1 ½ gallons the night before. We hit the road and about 30 miles out of Las Vegas the car quit again, showing the same symptoms as before. I opened the hood and the fuel pressure gauge showed about 6 pounds of pressure so I knew we couldn’t be out of gas. I suspected a fuel blockage, either in the filters located in the carburetor inlets or in the jets. I began to disassemble the Holley. When I disconnected the fuel line plenty of fuel drained out of the lines. I pulled the filters out and they were clean as a whistle. So I continued my “field strip” of the carburetor and looked at the jets. Again clean as could be. About this time a Jeep Cherokee pulled up behind us. Don and his wife Kelly get out of the Jeep and ask us if we need help. He lives in Pahrump, Nevada about 20 miles up the road and he also has a tow dolly behind his Jeep. Don offers to tow us to Pahrump and thinks he can find someone to fix it. Although I appreciated the offer I wanted to get it running again. One reason being that towing a car with a automatic transmission for any distance is not a good idea. I said let me get everything back together and see if it will run. Sure enough, it starts up and seems to be running fine. I did want to put it up on a lift and check the Fram fuel filter I had installed last year and see if it was clogged. Don tells me that he knows someone who has a lift in Pahrump. He says he will follow us to town and then will get us to a lift. When we get to the turnoff the car is still running fine. Jan and I talk over whether to take the time to go into town and see about repairs. After a short discussion we decide to go on into Pahrump and check out the filter. Don finds us a lube job/oil change place and they agree to let me put the car on their rack. Well as many of you have probably guessed, the filter is perfectly clean. Don thinks I should at least purchase a new Holley electric fuel pump to replace the one in the back in case it goes bad. So we troop over to the local NAPA parts store but they don’t have one. I should digress here and state that my car has an engine driven fuel pump as well as the aforementioned Holley electric. It has been running this way for over a year with the only situation being that at freeway speeds the car will sometimes act like it is running out of gas. 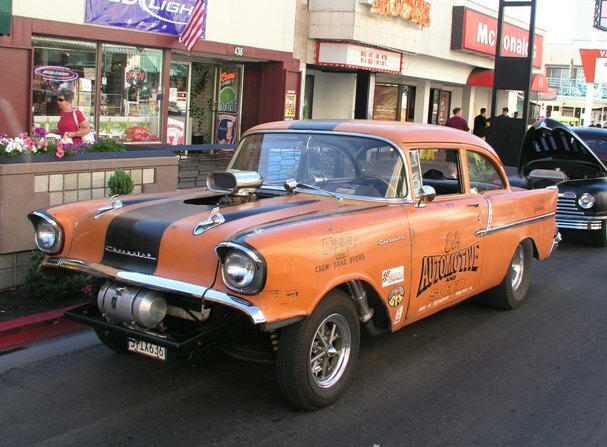 This first happened last year on the Hot Rod Power Tour. Simply turning on the electric pump solved the problem. I assumed that the engine driven pump was failing. When we returned from the Power Tour I ordered up a new engine driven pump. I decided to get a bigger pump capable of more fuel delivery thinking that was the problem. The new pump came and I tried to install it but it would not fit - it contacted the frame. So I called Summit Racing to see about returning it and during the conversation the Summit tech guy asked me why I was replacing the pump. I explained the problem and he said that Holley electric pumps are designed such that it is difficult to pull gas through them when they are off. To me that explained the situation whereby the car would act like it was running out of fuel during the Power Tour. I should simply run the electric all the time. I have a fuel pressure regulator so that shouldn’t be a problem. We have now used up about 4 hours messing with the car. We had originally planned to be in Reno by around 7 PM, now it would be closer to 11:30 PM. After a big thank you to Don and Kelly, we headed to Reno. The drive from Las Vegas to Reno is really quite pretty. The mountains are very colorful and that day there were a lot of thunderstorms around to add spectacular cloud formations and lightning as well as rainbows. One little town we drove through called Goldfield was almost a ghost town with lots of old buildings and one gas station. We needed gas, and had to pay through the nose for it, 4.79 per gallon for regular! It was an interesting gas station; there was a sign outside advertising weird beer. It turns out they really had weird beer! We bought 3 bottles of Polygamy Porter from Utah and three bottles of an Alaskan beer. We arrived at the hotel in Reno around 11:30 PM and checked in. We were directed to the parking garage and put the car to bed for the night. The next day we found the local coin car wash and cleaned up the car. My lovely wife Jan had given me an interior detail for my birthday to be done by her, so I claimed my gift and she did a great job. The car looked good so off we went to the Grand Sierra resort to get our registration packet. 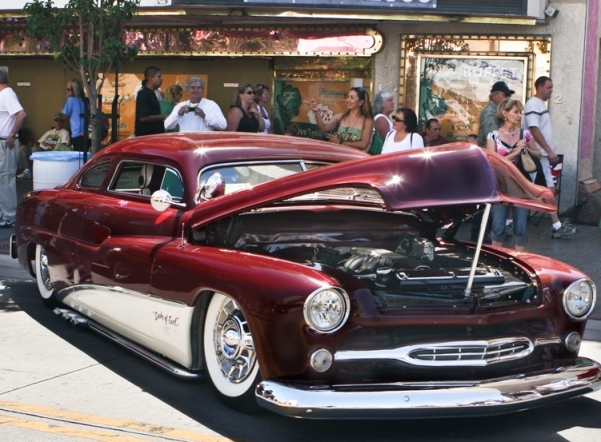 Hot August Nights is a different kind of car event than I had ever been involved with before. 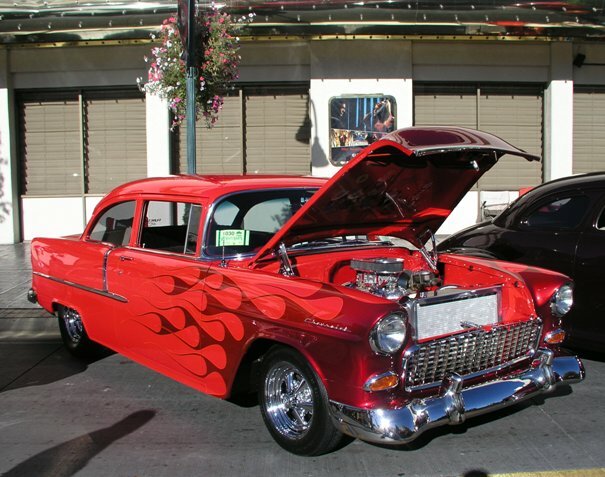 There are a number of venues primarily hotel/casinos to show your car. Also Sparks, a suburb of Reno has venues. At each of the different venues we visited there were vendors, food concessions and many giveaways. Lots of cars were cruising around the parking lot trying to find a parking space or just to see and be seen. So we cruised around a bit, parked a couple of times, had our photo taken against a special backdrop and mainly just took it all in. We were still sort of car lagged - not to be confused with jet lagged, but similar so we planned to make it an early night. Thursday was the poker run which goes up to Lake Tahoe. 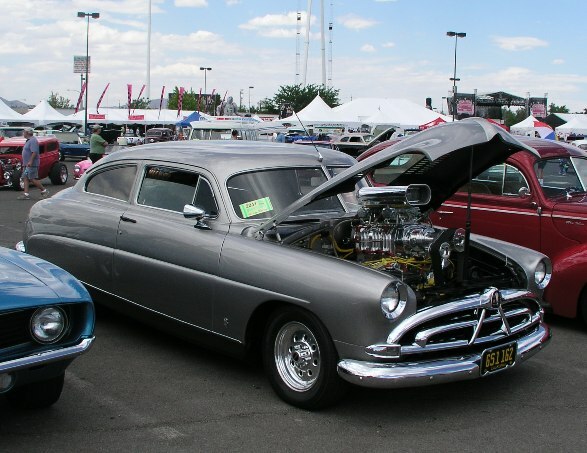 The poker run begins at Summit Racing’s store in Sparks. We got there around 10 AM and of course I had to go in and check out the Summit store. Around 11 AM we got our instructions and headed out on the poker run. We didn’t even make it out of town before the ugly gremlins hit again. I coasted off the road into a parking lot and I got out and opened the hood. Again the fuel pressure showed normal. As all of you know it takes three things to make an engine run: Fuel, air and a spark. I decided to check the spark. I pulled out the coil wire and had Jan turn the engine over and I saw a hot spark. Next I pulled a spark plug wire off and had her turn the engine over. It started - on 7 cylinders no less! So I hooked everything up and off we went. The drive up to Lake Tahoe is beautiful and of course, the lake itself is breathtaking. We had drawn a couple of cards by now but nothing good. The way the poker run was set up, there was a deadline to be at each card draw point. We were doing OK but since we got a later start than most, we could not dilly dally too much. The card draw in South Lake Tahoe was at another hotel/casino and was also supposed to be the lunch spot. When we got there we soon realized we would not have time to wait for the lunch there; furthermore they were out of the HAN lunch special. So instead we went to the local Burger King and once again were on the road towards our next card draw. We also needed gas and after a while we came across a station and filled up. But somehow we missed the turnoff we needed and went several miles out of the way before we discovered it. This made us late for the next card draw. We weren’t the only ones in that predicament, but they had already folded up their card table so we were out of luck. We pulled out and headed to the next card draw. We got less than 1/8 of a mile when the Chevy did its thing again. I was driving and managed to coast into a gas station. As we were rolling to a stop I turned the key and the car started up. Not knowing what else to do we proceeded on to the last card draw. Our hand was quite poor, so we weren’t going to win anything. Still, the drive by the lake was pretty and weather was beautiful. Jan’s daughter lives in Venice, CA and, since she had not seen her for some time she left the next day for an overnight visit. That worked out well for me as I wanted to go to the swap meet. I had accidentally left my locking gas cap at a gas station so I hoped to get new one. And I did not long after I arrived there. I walked around looking at all the stuff for sale and then walked over to an arena where they were having the car auction; nothing like Barrett-Jackson but still some nice cars available for bid. Every night except Saturday there is a cruise around the streets of Reno as well as in Sparks. The cruise lasts from 7 to 9 PM. Quite a few of the local people come out to watch the cars go by. They have the cars cruise in two lanes so the lines don’t get too long. 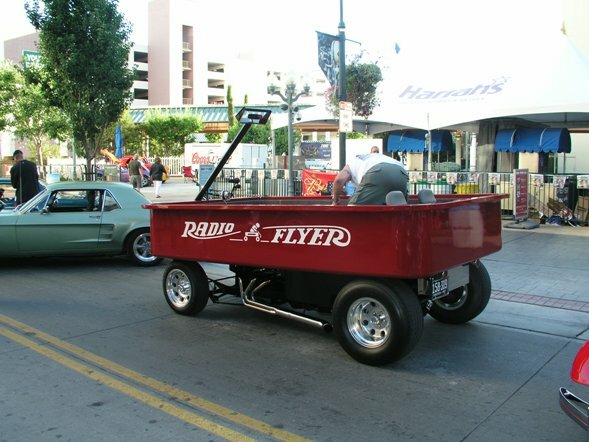 It so happened I was going along with an overgrown Radio Flyer wagon. It truly looks just like a kid’s wagon, except on steroids. 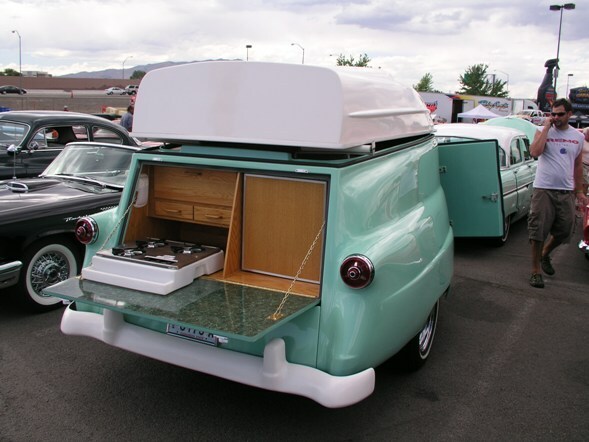 It even has a license plate, a towing handle (folded back over the open part) and places for 6 or 8 people to sit. Even so, my car got some attention. You are quite close to the spectators so you can talk to them as you go by. If the spectators liked your car, they would clap as you went by. Later that evening I called my good friend from California who has probably forgotten more about cars than I will ever know. We talked for some time and he didn’t really have much to offer about my problem but he did say that since the problems started after the installation of the fuel pump it probably made sense to look there first. He added that he had run both the Holley electric and engine driven pumps simultaneously without any problems. Saturday was the big car show. 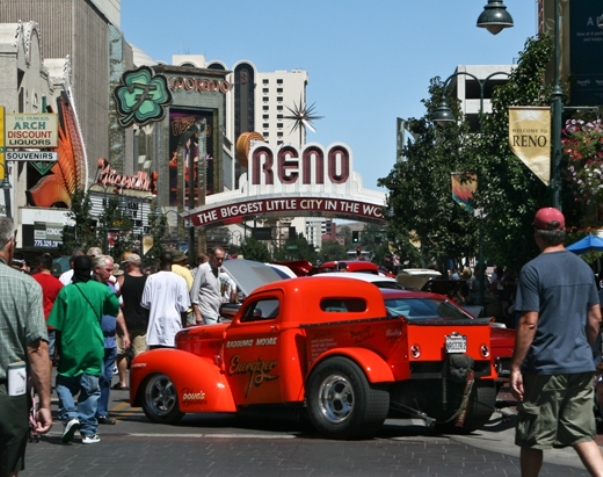 I had opted to show my car in the downtown Reno area, which was only a block or two from our hotel. Where you park is first come first serve. There are several different areas around the city for the show and each has a central marshalling point. I left the hotel at around 6 AM as I wanted to be in a certain area near the “Biggest Little City in The World” arch in downtown Reno. I got to park the car where I wanted and after cleaning it up a bit I had breakfast. 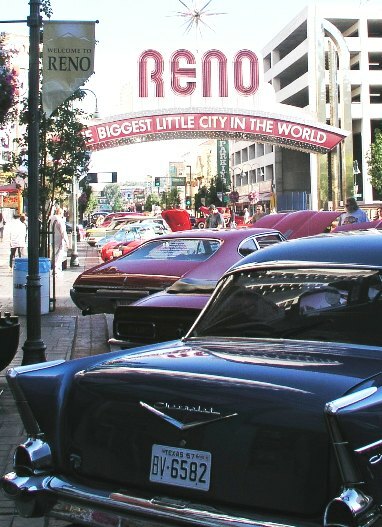 The Reno convention center was only a few blocks away and it was the location of the Big Boys Toy Store. Basically, it was a place where many aftermarket vendors had booths. So I took the opportunity to talk to the Holley representative about my gremlin in the fuel system. He felt that I shouldn’t be using both the electric and engine pumps together. Just choose one or the other and eliminate the other. This didn’t quite ring true to me as I have had many cars with both an electric and engine driven pump without any problems. 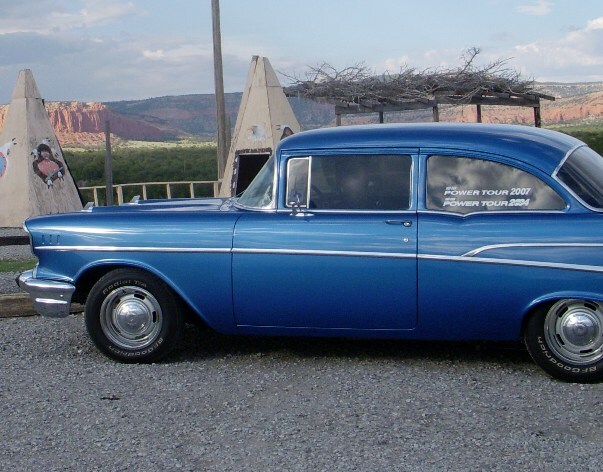 In fact, I had been using a Bendix electric fuel pump with the stock pump in my Chevy for several years without any problems before I “upgraded” it by installing the Holley. But he should know Holley products so I couldn’t disregard what he said. Jan arrived back in Reno mid-afternoon during the big show. 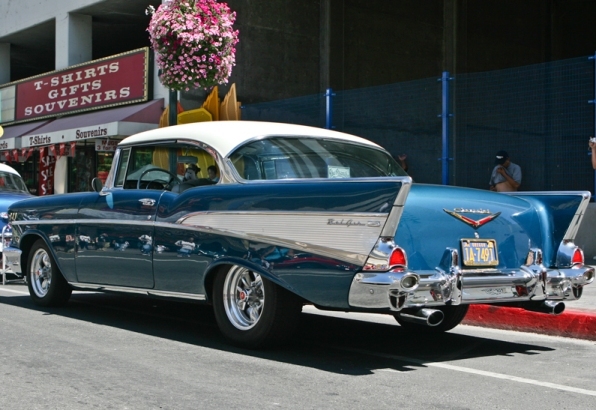 We walked around for a while looking at the cars and then I pulled my ’57 out of the show area. The Grand Sierra Resort had wine tasting every night and that night they would also have a big cruise around the hotel. So we drove over to the Grand Sierra and tasted “Hot Rod” wine, which actually turned out to be pretty good. Later we got in line for the cruise. 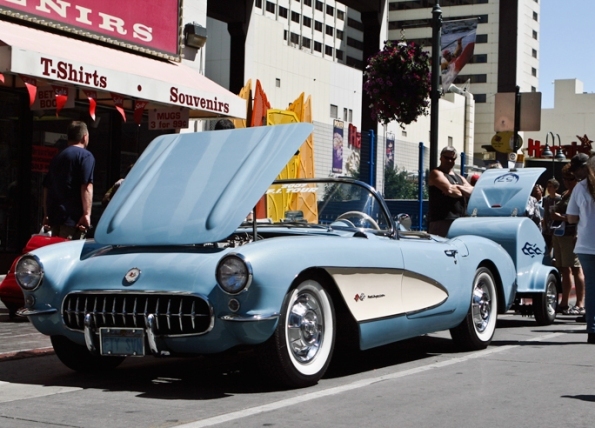 Again, like the cruise in downtown Reno, the cars went by side by side. They also had a large TV screen out near the parking lot along with a camera so you could see yourself go by on the screen. I am told that there was also live streaming apparently available on your computer. We ended up next to a guy driving a late 60’s Cadillac pulling a trailer with a man in the trailer playing the piano and singing Jerry Lee Lewis songs. The crowd loved it. A ’70 Chevelle pulled in front of us and the driver was revving the engine more than she used it for moving the car. The next thing we know, another Chevelle has gotten in line behind her. His is an all out race car, complete with open headers. So the girl revs hers up, and the race car revs his engine up. Needless to say the girl’s Chevelle was pretty tame compared to the race car. What was funny was her reaction, she knows she can’t compete with his noise-wise so she looked at the crowd, smiled and threw up her hands. It got a good laugh from all. When I talked to my friend from California, he said that a Holley electric pump can be disassembled by removing the bottom plate and then the pump vanes can be removed making simply a passage for the fuel. I now had a plan. Sunday morning was the last day of HAN and there was a big parade through downtown for all the registered cars. I decided to skip the parade and attempt to fix the car. Early Sunday I jacked up the car, (I carry an aluminum floor jack and two stands on our road trips), and took the bottom plate off the electric pump. I did have a catch can under the pump but very little fuel drained out. I removed the pump mechanism and the pressure relief plunger, put the plate back on and started the car to check for leaks. All looked good, so we began to load up the car. The Parade started at 10 AM and it was now roughly 11 AM. The parade went by our hotel and it was still going on so we decided to see if we could still get in line. We had to drive around to get to the start because so many streets were blocked off. Sure enough, we made it and we weren’t the last car in line! After the parade we all congregated back at the Grand Sierra Resort for the big drawing. Bank of America, one of the sponsors, gave away several cash prizes. We didn’t win anything, maybe next time! We waved good bye for now to Reno and HAN and headed towards California. The area we wanted to go, Murphys, CA is about a 4-hour drive from Reno. You must go over a couple of nearly 9000 foot passes to get there. Again, it was a beautiful drive, lots of big trees, small lakes and distant higher mountains. We arrived at our hotel about 6 PM and so far so good on the car. We stayed there two nights and then headed down Highway 99 to visit my sister for one night and from there we were on the road again, this time heading to Dallas. Just south of Bakersfield, we turned east and headed towards Needles, California where we were able to start tracking Route 66 again. We picked it up just east of Needles. This part of Route 66 is VERY windy and many of the curves have a speed limit of 15 MPH. 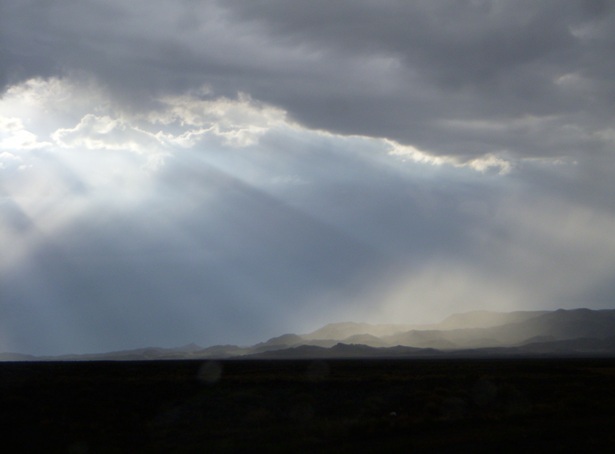 It is about 27 miles long before you rejoin the road to Kingman, Arizona. The terrain on this drive was quite beautiful, but it had many low places where during a downpour it would wash out the road. Unfortunately, there were a lot of handmade crosses with flowers on them along the side of the road. We took them to be where an accident had taken place, most likely with one or more fatalities. Many of the curves were decreasing radius turns which can fool you especially if your speed is excessive. In my mind I could see some drivers coming out here to test their mettle on a road like this. So the possibility for accidents is high, especially if alcohol is involved. This would be a very difficult road to navigate after dark as well. Jan was driving this stretch and she did a great job getting us through safely. About 19 miles along on this road, we came across the town of Oatman, Arizona. This was a mining town, very quaint with donkeys walking around on the main street. When we mentioned this to the people at our hotel in Kingman we found out that this has been going for many years and is sort of Oatman’s trademark. We also passed through another, even smaller town that had an old style gas station complete with gravity feed pumps, another photo op. The next day we continued our trip home, but did less of Route 66 since we had been on this part of it on the way out. 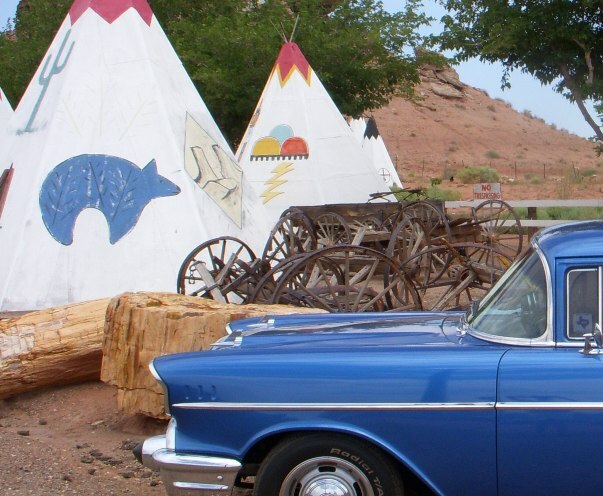 We stopped for the night in Gallup again and then again in Amarillo before the last leg home. 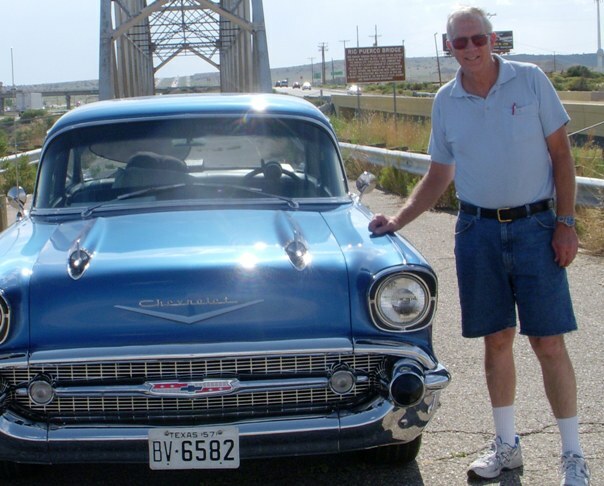 We arrived in Dallas at 4:30 on Saturday, August 9th after putting over 4300 miles on the ’57 Chevy. I know you all want to know, how did the car perform coming home? The answer: Perfectly, it never missed a beat. We even got a little better gas mileage. So when I get time I will remove the Holley electric pump and eventually replace the gas gauge and since it is a fair amount of work, I will also replace the temperature gauge with one that reads actual temperature numbers instead of “C” and “H”. 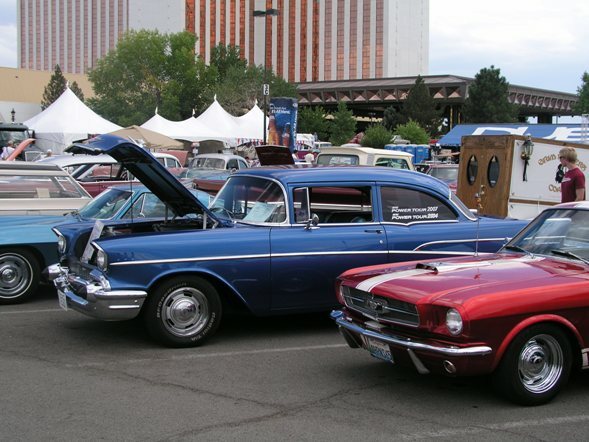 Hot August Nights was great and the trip to and from Reno was good too, in spite of the problems. But it could have been worse. I especially liked the A/C along with the cruise control. We always take a lot of books on tape to listen to and that really helps the time go by. I am thinking about bucket seats as the bench is not as comfortable for my older body as when I drove these cars 40 years ago. Would we do it again? Well, all I can say is that we already have our slot for next year. Of course we will make the final decision as we get closer to the date, but we are planning on going again. We did have fun, saw and did a lot of neat things, both at the event and on the trip. Sights on the road to Reno and at Hot August Nights '08 !